With some other modern git clients it might take several seconds before the app launches. One of the goals of NitroGit is to have a snappy startup time. Expect half a second startup times for even huge repositores. If command line Git can start quickly, there’s no reason why a GUI app couldn’t. Command line Git is our benchmark for performance on huge Git projects: it should not be slower to perform an operation in UI that you can do via command line. Git has a huge toolbox of commands. None of the UIs can fully replace its command line. NitroGit is not trying to. The goal is to make a simple and intuitive UI for 80% of the use cases, and have Git Bash integrated to help with the rest. The UI should be transparent in what it does, it should not try to oversmart Git. The Git terminology is used for UI elements so that beginners can always find help from people who know Git. There’s an industry trend to make slower and slower software in order to force you into buying new hardware, update it with the new software and keep the vicious cycle going. One of the NitroGit goals is to support older hardware and Windows versions. Currently it supports Windows back to Vista, including 32-bit versions of Windows. See full system requirements on the download page. The current version takes less than 3 Mb of disk space, which is typically 20-50 times smaller than any other Git major client app. It is portable, so you can have several copies of it, which can be useful to work on multiple projects. NitroGit offers a well-known old school classic Windows UI based on standard controls. No fancy UI, no bells and whistles approach supports the other goals too: being fast, lightweight and accessible and easy to setup. The first version presents a zip file - a portable installation package. Later on a silent installer will be available. This is to contrast with some other Git clients that take minutes to download, install and setup, present a lot of bothering setup wizard questions, and require you to register a corporate account at the end. None of that is going to bother you. Git is a set of software tools that does source code versioning. Git for Windows is an official package that is provided by Git authors. It only has a command line interface and no UI. It is fully featured otherwise and compatible with the Linux version of Git, because it is implemented on top of a MinGW compatibility layer. NitroGit is a desktop client for Git that works on Windows OSes including Windows 7, Windows 8 and Windows 10. Windows 7 64 bit, Windows 8 64 bit and Windows 10 64 bit are supported too. 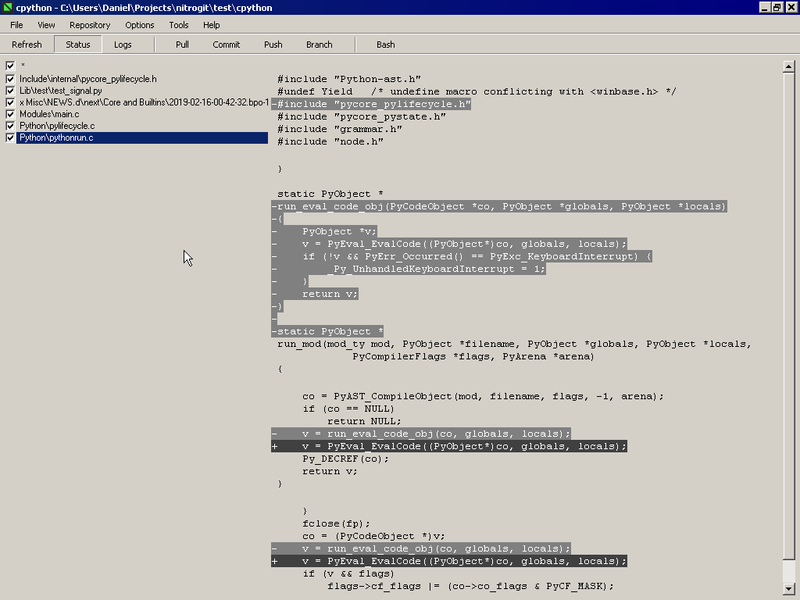 NitroGit is is a Git GUI (graphical interface) tool. It is very basic and supports most of the day-to-day use cases. Install a portable Git client setup by unpacking it into any folder.